Here are the questions I answered on Catholic Answers Live on September 28. One lady asked me why the Greek "Kyrie" is retained in the Latin Mass. My answer was "I don't have a clue, but will look it up and post it on my blog. I posted the question on my Discussion Forum and here are a few of the responses. Click here to read them. 1) In the early Church there were many divisions. There was no "Roman Catholic" Church, only catholic and apostolic churches. Could an ecumenical council bring unity back to Christianity? 2) How are the Church Fathers taught in Protestant seminaries and universities? 3) Have you been to the catacombs and what impact did it have on your life? 4) Why is the Greek "Kyrie" still in the Latin Mass? 5) How can Protestants and others ignore the overwhelming Catholic element in the early Church? 6) A Baptist asked "Why did the Catholic Church incorporate so many pagan elements? How can you justify that? The RealAudio link is here, here to listen, or here for podcasts and other means of listening. Join us in the Holy Land this November. Click on the brochure for more information, or visit our pilgrimage site here. Join other excited Catholics from Catholic Scripture Study. Open to the public. "Supreme Court Settles Abortion Issue”: So declared the New York Times the day after the Court’s Roe v. Wade decision. But as the past 34 years have shown, there is no question less settled in American public life than abortion. 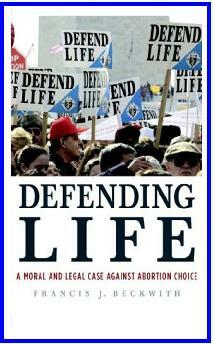 The pro-life movement has succeeded in keeping the debate alive — and in his new book, Defending Life, leading pro-life scholar Francis J. Beckwith offers a precise statement of the philosophical and jurisprudential case the movement has developed. Beckwith begins by defusing the “don’t impose your morality” slogan. Everyone, he argues, recognizes the absurdity of being “personally opposed” to murder but refusing to “impose” that view on others. State neutrality is impossible; either the law recognizes the unborn as persons and protects them, or it does not and permits the killing of them. That the fetus is a person with rights is no more religious a claim than the assertion that the fetus is not. Our task is to determine which claim is true. Click on this link for the full review. Click here for Dr. Francis Beckwith's homepage. Click here to see the book on Amazon.com.